Sri Maha Shivaratri means "The Night of Shiva". The ceremonies take place chiefly at night. This is a festival observed in honor of Lord Shiva. Shiva was married to Parvati on this day. This is the night when Shiva is said to have performed the Tandava or the dance of primordial creation, preservation and destruction. People repeat the Panchakshara Mantra <?xml:namespace prefix = v ns = "urn:schemas-microsoft-com:vml"> <?xml:namespace prefix = o ns = "urn:schemas-microsoft-com:office:office"> as it is said he who utters the Names of Shiva during Shivaratri, with perfect devotion and concentration is freed from all sins. He reaches the abode of Shiva and lives there happily. He is liberated from the wheel of births and deaths. Many pilgrims flock to the places where there are Shiva temples. Once Lord Vishnu and Lord Bramha argued over each others prowess. However, Lord Shiva challenged both of them. He appeared as a flaming Linga and challenged the duo to measure the gigantic Linga (phallic symbol of Lord Shiva). Lord Bramha, who took the form of a swan, and Lord Vishnu who became a boar and went to Netherland, were both unable to measure the Shivlinga. Then Lord Shiva came out of the Linga and declared himself the most powerful. Maha Shivratri therefore means the grand night of Shiva. The devotees of Shiva fast during this day and pray to the lord throughout the night. 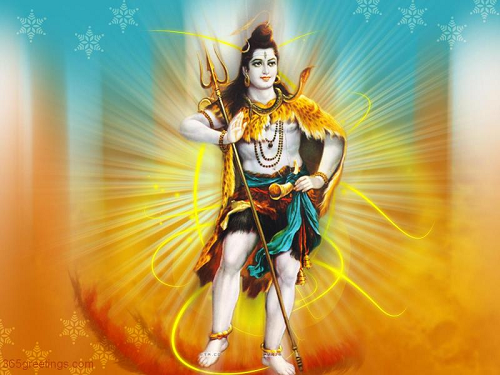 This legend goes to prove the supremacy of Mahadev over other Hindu Gods. King Daksha opposed Sati's marriage with Shiva. At a yagnya (holy sacrifice) the king ignored Shivas presence and thereby insulted the latter publicly. Sati was so angered by this that she jumped into the sacrificial fire and ended her life. Lord Shiva unleashed his fury at the death of his wife by performing the violent dance, Taandav. He wiped out Dakshas kingdom, undertook rigorous penance and retired to the Himalayas. The Gods, who feared that the severity of Shivas penance might bring an end to the world, revived Sati in the new avatar of Parvati. Shiva-Parvati married and this reunion is celebrated on Maha Shivratri. One who recites these 12 names regularly in the morning and evening he washes all the sins committed in the previous 7 births and attains all the powers and Siddhis.